Duro-Seel Clear is a famous time saving curing compound and ‘same day sealer’ surface treatment used as a single coat application to all freshly placed, compacted and finished concrete, mortars and other cement bound materials. This procedure forms a hardened film of low moisture vapour penetration to seal in the original mixing water which enables its reactions with cement to continue and to ultimately obtain full strength development, surface hardness and lower shrinkage of the material over 28 days or more. Duro-Seel Clear proven over two decades is also a two (2) coat penetrative clear protective sealing coating for suitably prepared existing hardened concrete pavements, floors, walls, and roofs. Duro-Seel Clear is an acrylic / rubber co-polymer low lustre non-aqueous, safe-to-use solvent resin based lacquer surface coating. With a two (2) coat application it provides a high performance protective coating for existing exterior and interior in situ concrete, concrete components, concrete products, mortars, engineering grouts, and other mineral based materials. Duro-Seel Clear is preferably used as a liberally applied single coat clear liquid curing compound for all cement bound materials (a moisture retentive, film-forming curing coating membrane). It is considered an ideal, easily applied, time saving application to freshly placed, compacted and finished concrete, mortar or engineering grout immediately after or, if it can be applied without damaging the concrete, slightly before these materials have set. In this way, no surface preparation is required say, if the product was specified to be applied later to the then hardened existing concrete. A further coat applied later without the need to prepare the surface, provides a fully cured and sealed project. This translucent clear coating does not ‘yellow’ or turn ‘brown’. Apply only to surfaces that have been properly prepared to remove the usually apparent weak surface layer of cement scum called laitance by means of 3000 psi water blasting or acid etching. 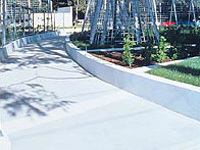 With a minimum of two (2) coats or layers applied, the product’s early water resistance and adhesive strength (which allows a ‘pass’ for flooring moisture meters used prior to laying vinyl tiles or vinyl sheet), are features that has made it a famous, reliable material for interior protective clear applications on to existing set, hardened, cast-in-place concrete floors and exterior pavements - properly prepared for sealing. In addition Duro-Seel Clear may be used for concrete roofing tile manufacture, on concrete blockwork / baked clay brickwork walls, and other hardened existing cement-bound products and materials. Curing is a procedure adopted to retain a cement bound material’s mix water in the material to prevent its evaporation over an extended time - thus ensuring that the material’s full hardness and strength development will be achieved in place, ie the first coat of Duro-Seel Clear applied as a moisture vapour retaining curing compound retains the mix water within the concrete to allow complete hydration of the cement / water binder. What are the key benefits of the Duro-Seel Clear product? • has good UV radiation stability (2 coats). Yes. It can be applied easily by using suitable spray equipment, roller, brush, or to act like a large paint brush - a suitable soft hair broom. Duro-Seel Clear, if applied to say driveway concrete, having a 28 day compressive strength of 25 MPa, with the recommended total of two (2) coats, provides a low lustre/low sheen clear finish. Can other coatings be applied over Duro-Seel Clear? Yes. Should Duro-Seel Clear have been applied as a curing compound, as is highly recommended to freshly finished concrete and other freshly finished cement bound materials, then following a day or two later, another coat can be applied as a finishing coat. Alternatively, instead of another coat of Duro-Seel Clear, the finishing coat may be a single or for extra durability, two (2) coats of Ability’s water based Dy-On-Crete® Mark 2 pavement coating finish in one of the choice of the 12 colours available. Are there any limitations for the use of Duro-Seel Clear? Whilst resistant to typical water-based detergents when used to clean a Duro-Seel Clear surface, the product is not highly resistant to fats, vegetable oils and chemical solvents. Therefore, it is not recommended for use in bakeries, printing shops, and other areas requiring this resistance and details of other suitable Ability Long Life coatings such as Durosheen® , duro paint™, and Leviathan® Matte may be requested. Certainly, but care must be taken with existing hardened concrete in preparing the surface to be sealed, removing weak surface laitance and to make it sound, firm, and clean. If in doubt, Ability recommends that you employ qualified professionals who have proven to be experienced and skilled in this kind of work. What coverage is to be achieved? Recommended coverage per coat is 4-6m2 / litre. For durability, the recommended minimum DF (dry film thickness) of each coat is 100μm and a total DFT for two (2) coats of 200μm. What packaging does Duro-Seel Clear come in? It is supplied in 20 litre steel pails. Yes.These are free of charge. Please contact Ability. Before actual use, Ability recommends to always test first. Trials prior to project use are essential.